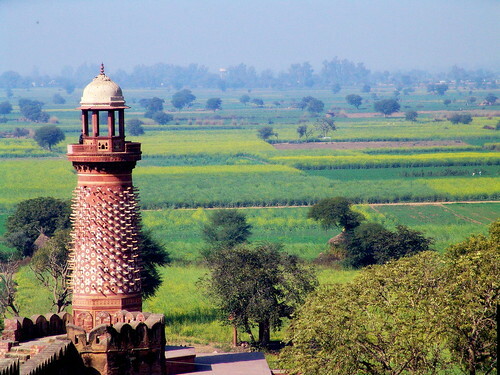 'Hiran Minar' (Deer Tower) at the out-skirts of the Palace complex at Fathehpur Sikri, has a singular-looking architecture - It is studded almost all over with 2 feet (61 cms.) long marble stone replica of elephant's tusks. 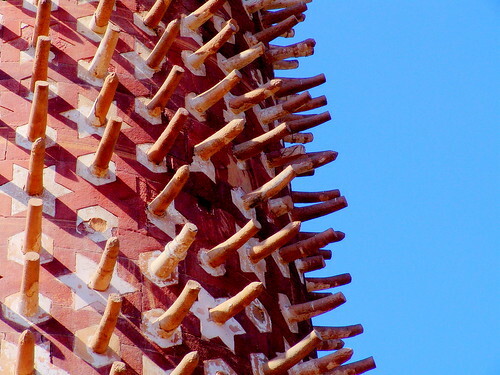 This 90 feet (about 27.4 metres) high tower was built in 1571-2 by Mughal Emperor Akbar. Akbar had a penchant for elephants and loved to break and control wild elephants. It is possible that it was his way to emphasize his skill at controlling the elephants. Another theory says that the emperor used to watch from this tower the combat or killed the animals, driven together for his diversion. Yet another theory says that the royal ladies used to watch from this tower Akbar's antics with the elephants. The local guides say that the tower is the tomb of Akbar's favourite Elephant named 'Hiran' (meaning: antelope/deer) on whose back Akbar had fought and won many battles and the marble spokes represents the studded armour of his elephant. In Indian sub-continent the fast pace is often referred as 'Hiran ki tarah tez' (fast like an antelope/deer). It is likely that Akbar's favourite may have been the fastest pachyderm in the royal stable. Hence the name 'Hiran'.